myCountyMarket :: Where are the Coupon Inserts? Where are the Coupon Inserts? One of the first things you learn when becoming a coupon shopper is that there are cycles to coupons. Often you will see a coupon "Drought" or lack of coupons being offered. There are times when coupons are flush in the marketplace and you can coupon just about anything. The key of course is finding sales that match up when the coupons are flush. Part of this random seeming ebb and flow has to do with the printing and distribution. Many national manufacturers are set on scheduled created by the newspaper insert schedule. SmartSource and Redplum coupon inserts have a set schedule each year for coupons. This only allows a manufacturer to create offers when they will be dropped and inserted into all local Sunday newspapers. The schedule, omits all national holidays. Yep. That means if there is a holiday week, there will be zero newspaper coupons. Usually all offers pretaining to that particular holiday are issued 2-3 weeks prior. Then they take a break, and do not offer any coupons during the holiday week itself. Here is the 2018 schedule for newspaper insert coupons. One of the things you can do, is make plans to get extra coupons on the weeks where there are multiple inserts offered. Think about it, you pay $1.50 for a paper and you can get 10 coupons or 50. 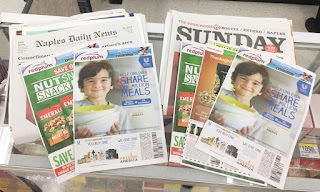 Which is the better time to buy a Sunday paper for coupons? Most printable and digital coupons offered are following this marketing schedule. You will see heavy offers just prior to a holiday, and fewer afterward. Make your buying plans according to the times when more offers are available. Good luck with your coupon gathering.